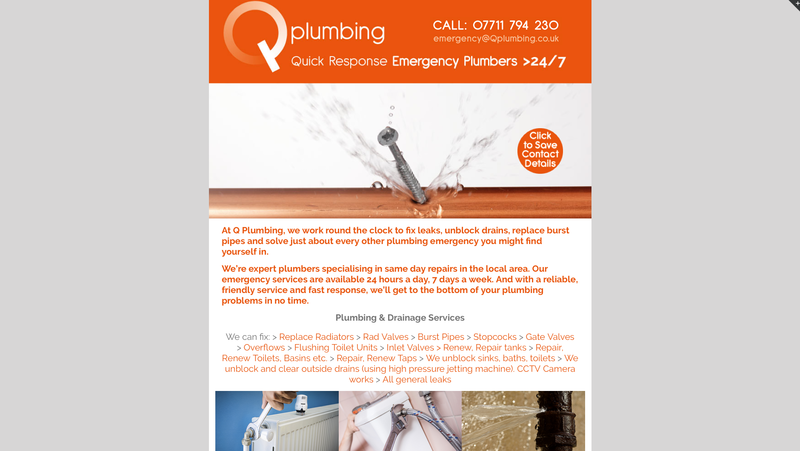 An established business specialising in emergency plumbing, Q Plumbing were looking for a website that was efficient and straightforward – just like their services. So we created a simple one-page site, with an emphasis on rapid response and made especially for mobile. The main banner contains a link which allows you to their contact details in the form of a vcf file or electronic business card that you can easily save to your address book. A click on the telephone number in the top right of the page also automatically puts the number into your phone so you can call straight away in times of necessity. And for those less urgent visitor enquiries, there is also a contact form at the bottom of the page for those who wish to get in touch via email. We also created all written copy for this website, again, with an emphasis on immediacy whilst encouraging users to contact Q Plumbing. As a company which carries out the majority of work in client’s homes, it was important that we made it clear which areas Q Plumbing covered – so we included detailed information about the specific locations that are served by the business.